As a teacher, I’m always ready for a vacation by the time spring break rolls around. Since it’s only a week, we usually plan on a park that we can really explore in that time frame. In 2017, we ditched a chilly, windy April in DC for a week in Tucson. It felt pretty good as we left the airport and felt the arid climate for the first time. 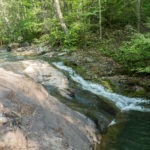 We headed to Gilbert Ray Campground to check in for our first two nights in the area. We got out of the car. And the heat started to kick in. A visit to the Arizona-Sonora Desert Museum seemed like a good place to start our adventure. 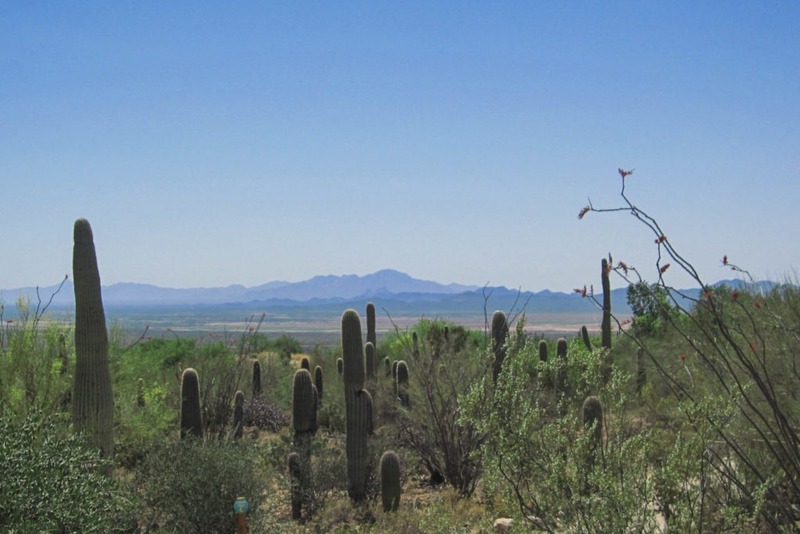 Travis had never been to southern AZ, and I hadn’t visited the area in almost 20 years, so we wanted to learn about the climate, wildlife, and landscape. As we drove through Tucson, we saw gorgeous views of the mountains in the distance. I wish we could see mountains like that just driving around at home! As we got closer to the museum, which is just outside Saguaro NP, the roads became windy and hilly with a single lane on each side. Travis was driving, and I kept reminding him to go slow since we couldn’t really see over the hills. The occasional cyclist added an element of surprise. 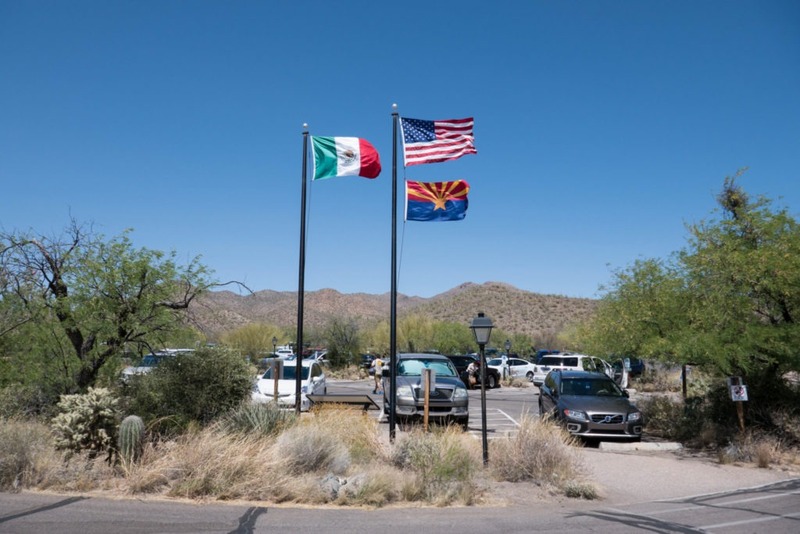 We pulled into the museum parking lot and were greeted by the US, Mexican, and Arizona flags. The lot was crowded, but we found a spot after a short search. The museum is a pueblo style building – a low, unobtrusive structure with a flat roof – that blends well with the desert landscape. 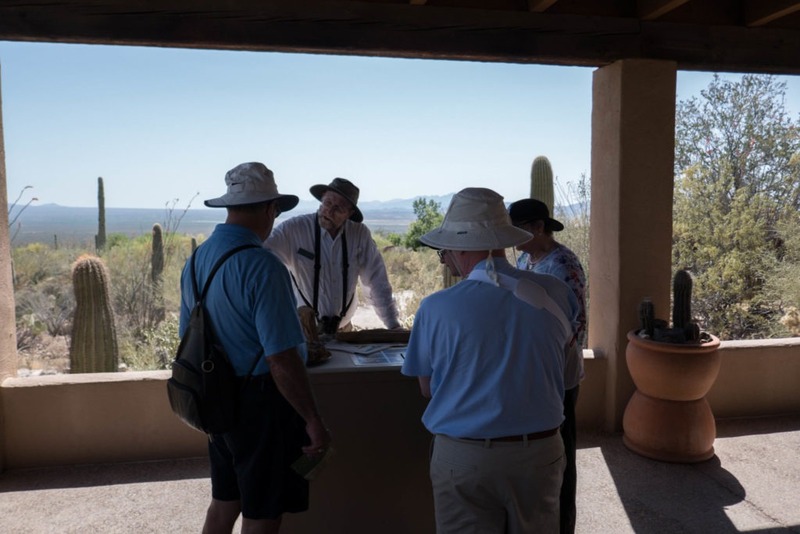 As we approached the museum, we had a gorgeous view of the Sonoran desert through an opening in the center. This indicates that most of the museum is outdoors, so you get the full experience (including unlimited direct sun). We paid about $21 per person to enter, and headed through the gate. Our first stop was a board near the gift shop to see which docent programs were happening that day. There was a presentation on the saguaro cactus that afternoon, so we made a mental note and continued on. Next, we headed out back to take a walk in the desert landscape. We walked around the winding paths, and enjoyed viewing the saguaro with a mountain backdrop. The view as you enter the museum. Not like any museum I’ve ever been to! The heat and direct sun were getting to us, so we decided to take a break. After a stop at the bottle-filler (which we were very thankful for), we still felt overheated, so we went into the museum gift shop, which had glorious air conditioning. I browsed jewelry and knickknacks until we reached the small cafe at the back. After careful consideration, we each decided on a popsicle and a bag of chips. I’m not usually into popsicles, but this was no ordinary day. We took them outside to enjoy as we explored some of the exhibits – they were a huge help so we didn’t get overheated. Maybe I’m being dramatic, but we weren’t used to this kind of heat, especially in April! 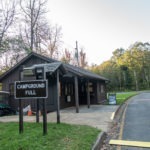 The museum has viewing areas for many different animals. 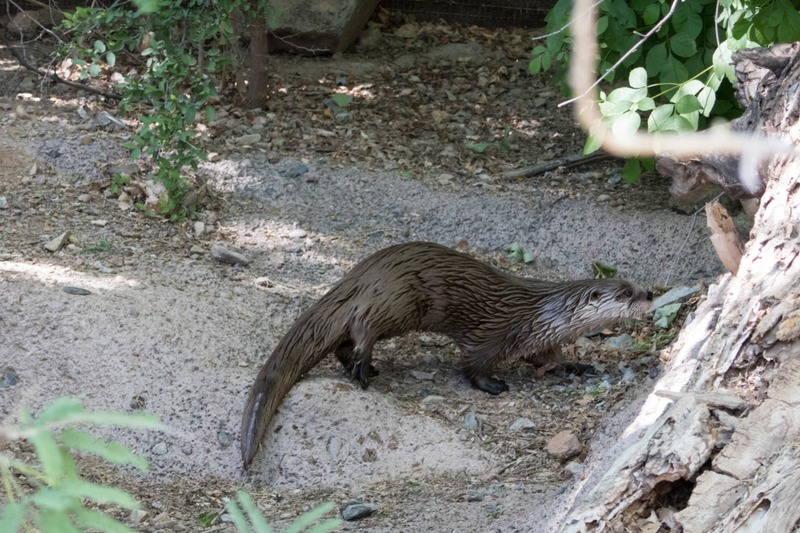 We saw an otter swimming in a pool. In was cool to watch him (or her) glide effortlessly through the water. An aviary had some more wildlife for us to see. It was a bit strange to hear and see birds flying overhead, and to round a corner only to find a huge bird sitting on a branch a few feet ahead. These guys are clearly used to having people nearby. Of course, the aviary is enclosed with a screen high overhead, and has lots of trees where the birds perch, so it provides some respite from the sun. Travis’s favorite spot was the hummingbird exhibit. He loves to take photos of wildlife, and he would spend hours snapping photos if I let him. Several other visitors were also trying to get that perfect hummingbird photo, so it got a bit crowded in spots. 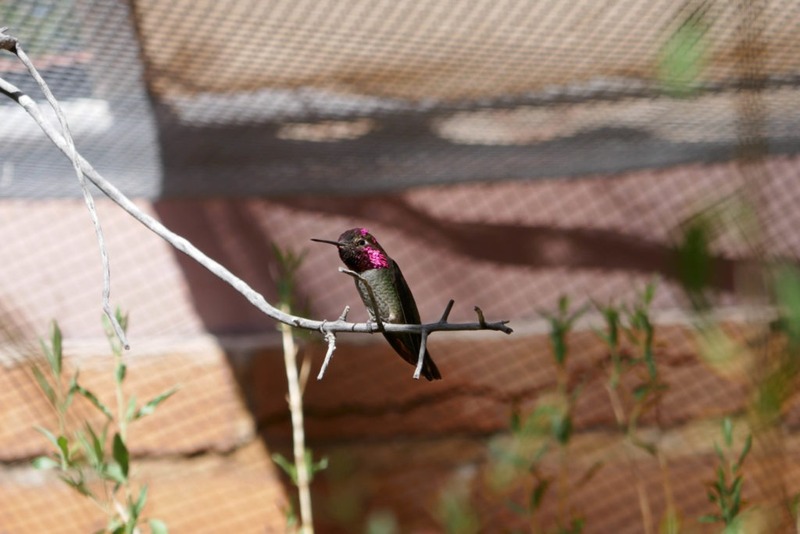 Some of the hummingbirds were tiny, and in unexpected colors. If you looked closely, you could also spot their nests. This guy was chill as we took tons of pictures. 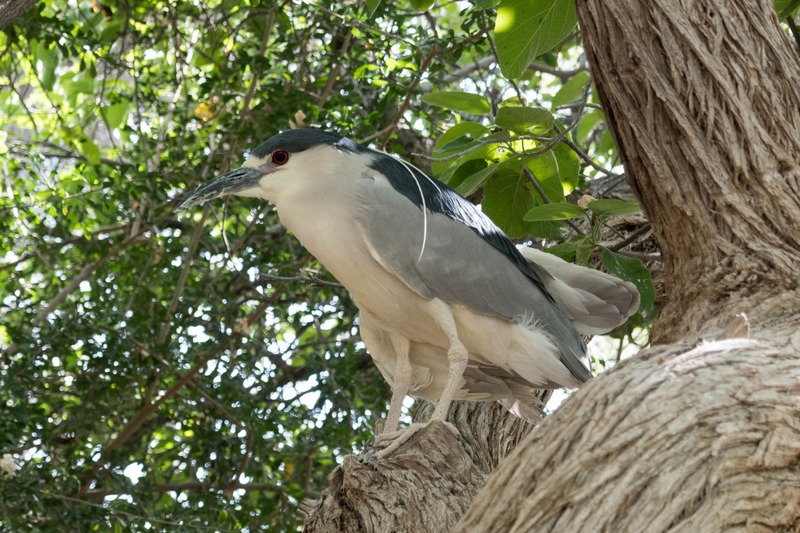 He’s a Black Crowned Night Heron (Nycticorax nycticorax). There are many docents scattered around the museum. One showed us a young desert tortoise. It was really cool to observe up close. Visitors over age 3 can touch the shell. Apparently, this is because you can get Salmonella from turtles. Who knew? We ran into another docent who asked us if we were interested in jojoba oil. We weren’t. 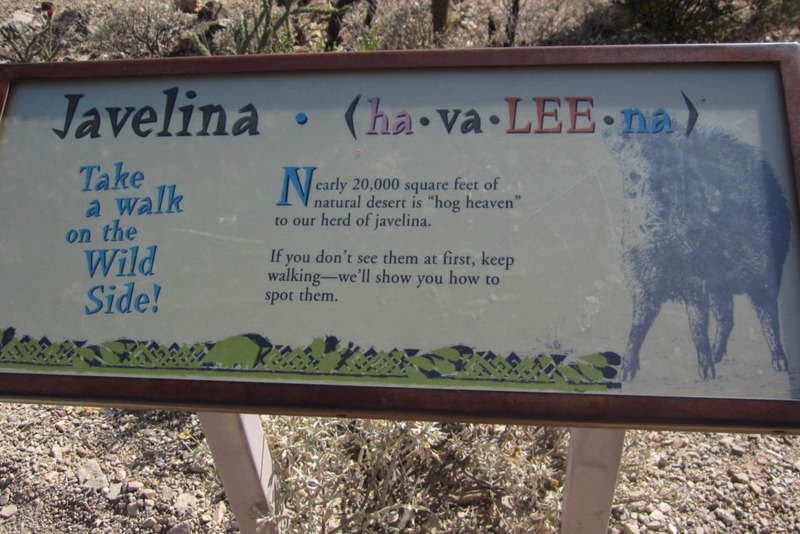 But we didn’t want to be rude, and it turned out to be pretty interesting – what caught our attention was that there are male and female jojoba trees, and they’re pollinated by the wind. She showed us how to differentiate between the two. 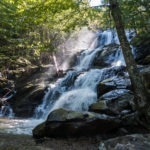 We thought this was actually pretty cool, and something we could look for on the trail. Soon it was time for the saguaro decent presentation. 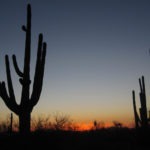 We met in Vista Ramada, a small covered porch area with a great view of the Sonoran desert. There were a few others attending the talk, including a family with a child. The docent made jokes, was very informative, and especially made sure to engage the child in conversation. We learned that a saguaro cactus has a wood skeleton (I had been wondering what gave them their structure, but never thought to ask). This made sense, since they can grow up to 40 feet tall. There was a dead saguaro right next to the porch, so you could see its wood “skeleton.” As a teacher, I consider myself a lifelong learner, so I gave this presentation a thumbs up. When we needed our next shade break, we headed into another indoor section of the museum: the reptile house. 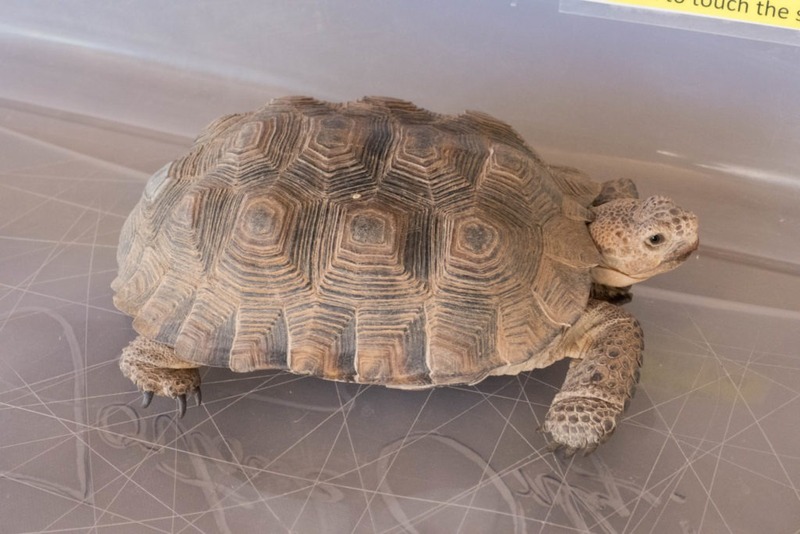 There were tarantulas, snakes, lizards, and…that was enough for me. So we filled up our bottles again and headed back outside. One of the coolest features of this museum is that it has its own trail. 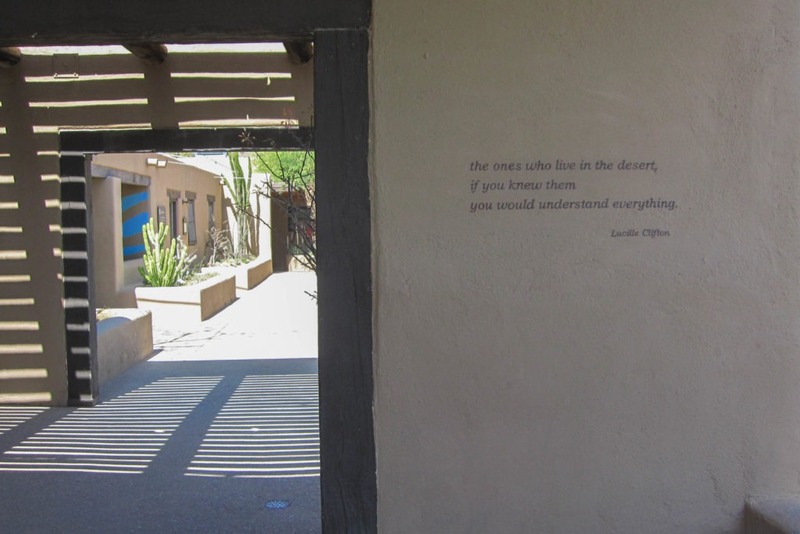 It’s situated behind the museum, in the desert landscape. 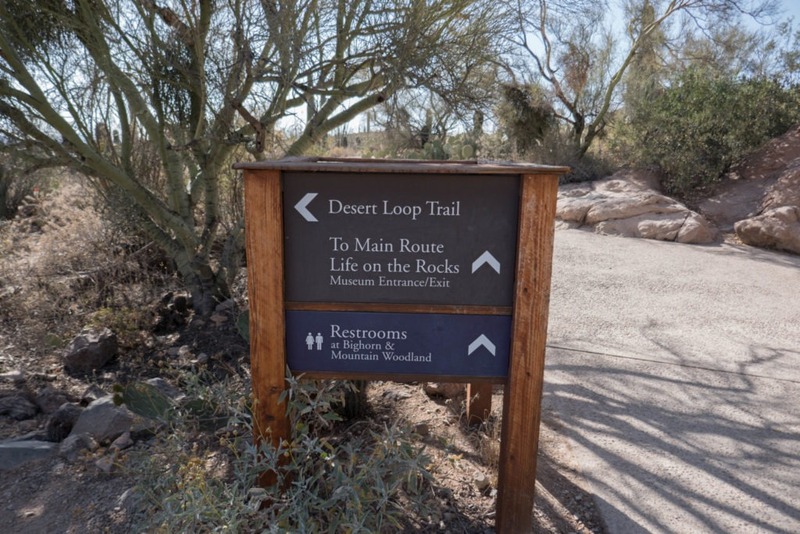 A warning sign explains the trail’s purpose and amenities. 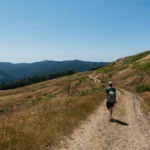 I recommend taking plenty of water, sunscreen, a wide-brimmed hat…and maybe a popsicle. As we walked the paved loop trail, we looked for wildlife among the desert vistas. Even though signs and the museum map indicates where the animals are located, we had to search to find them. 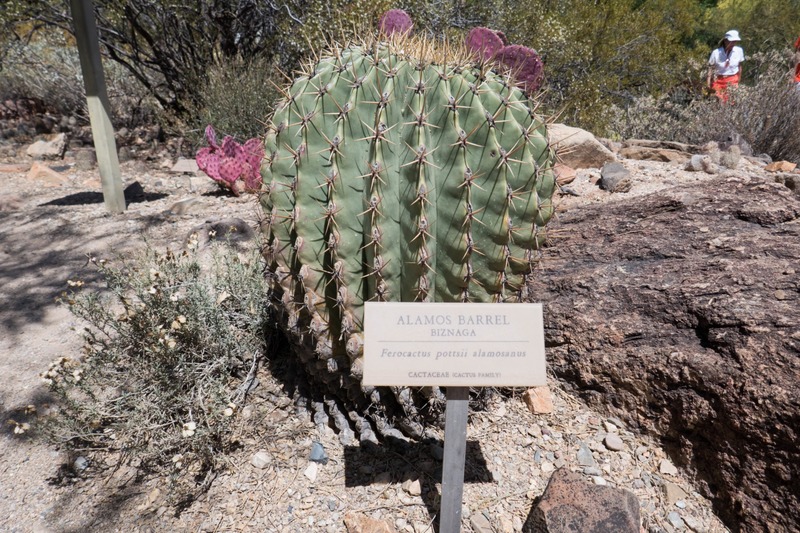 We were also introduced to some desert plants including the saguaro (who saw that coming?) and the ocotillo. We found some javelinas! 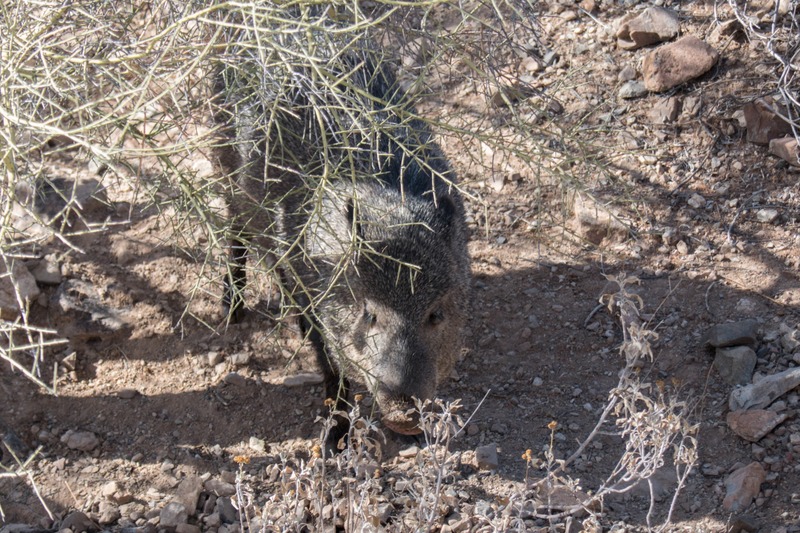 They are a peccary, not a pig. 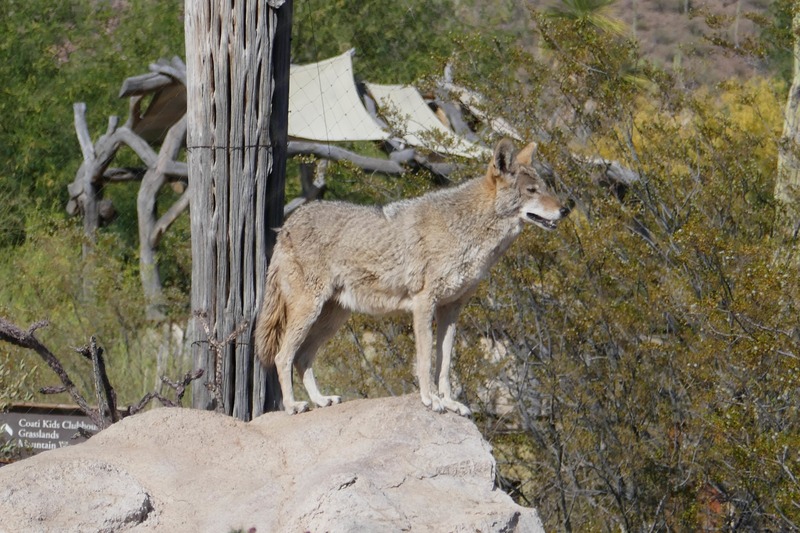 A coyote along the Desert Loop Trail. We saw a coyote in the wild a few days later, but only briefly as we were driving. After walking the desert loop, we were tired, hot, and the museum was about to close, so that was our cue to go get dinner. Being from DC, we are used to having access to many great museums free of charge. 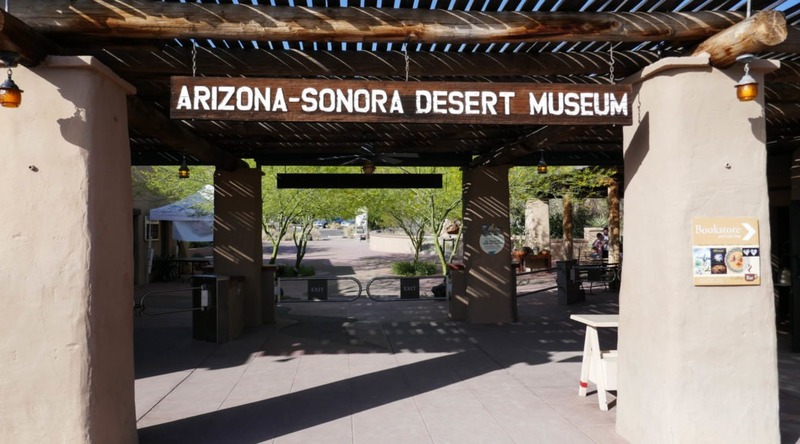 However, we were happy to support the mission of the Arizona-Sonora Desert Museum, and recommend that others visit it, too. The docents are friendly and knowledgeable. You’ll learn a lot, and be able to spot some really cool desert wildlife. And you can further support the museum by grabbing a cool treat on a hot day.